New York, M. Knoedler & Co., Alexander Calder: Sculpture of the 1970s, 1978, p. 15, no. 15 (illustrated). Madrid, Galerie Theo, Calder, 1989. This work is registered in the archives of the Calder Foundation, New York, under application number A02139. One of Alexander Calder's celebrated standing mobiles, Turkish Delight is distinguished by the elegant dark serpentine form that supports an assortment of striking, colorful elements. 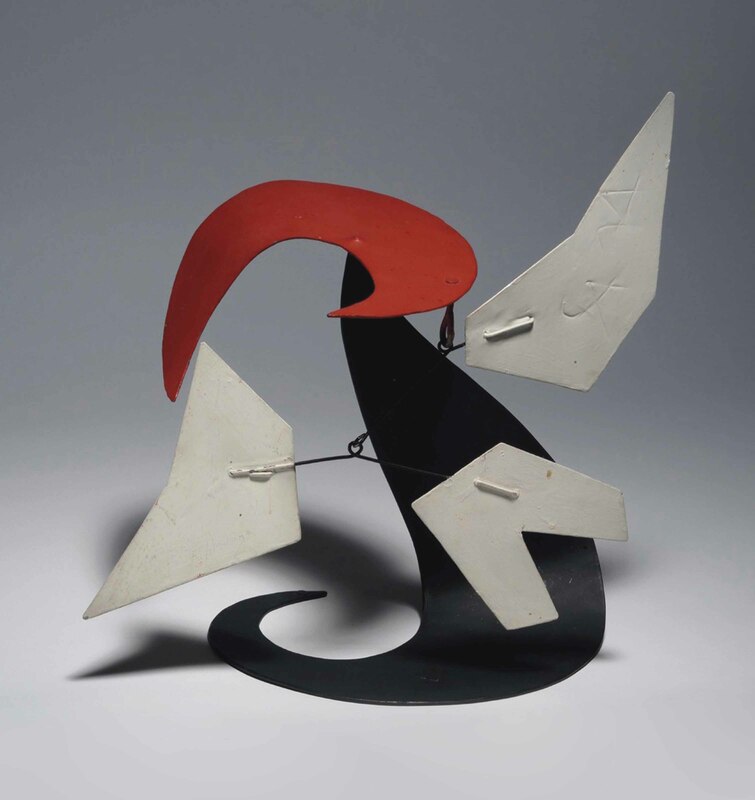 The combination of this curvaceous form and angular components speaks to Calder's unique compositional and engineering prowess, whereby he combines seemingly contradictory elements into one glorious piece of sculpture. Executed in 1974, this work combines two of the artist's most celebrated forms. During the latter period of his career, Calder had expended most of his energies on larger stabiles-monumental pieces of architectural sculpture that graced public spaces around the world. Yet he retained his interest in his iconic mobiles, the dynamic forms with which he established his career, and as such Turkish Delight combines the structural integrity of these larger works with the delicate movement of his mobiles into one compelling work. Composing these delicate configurations was a process that took time and consideration, and using his skills as an engineer (Calder graduated with a degree in mechanical engineering), the artist managed to combine a number of complex visual and mechanical arrangements into an object that radiates with aesthetic and technical virtuosity. 'I begin at the small ends,' he said 'then balance in progression until I think I've found the point of support. This is crucial, as there is only one such point and it must be right if the object is to hang or pivot freely' (A. Calder, quoted in Alexander Calder: 1989-1976, exh. cat., National Gallery of Art, Washington, D.C., 1998, p. 232). In addition to its elegantly balanced form, Turkish Delight is also distinguished by its chromatic range. Color was an important expressive device for Calder and one of the most important factors in his compositions. For Calder, color was not a representational force but rather an emotional one, in much the same way as Henri Matisse and Andr Derain, the historical pioneers in non-traditional use of color. As Calder once commented, 'I want things to be differentiated. Black and white are first - then red is next. I often wish that I had been a fauve in 1905' (A. Calder, Calder, London 2004, p. 89).